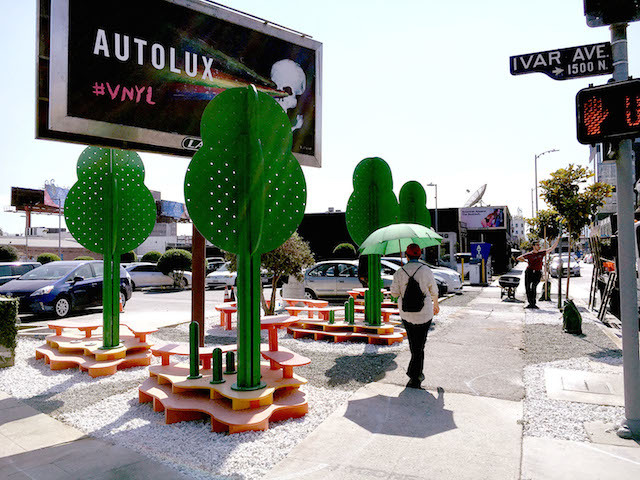 A nook within the concrete jungle in Hollywood just got a little more pedestrian-friendly thanks to a new pop-up park. Hollywood Pop! is the new semi-permanent park (remaining open through 2016) at the southwest corner of Selma and Ivar near the Hollywood Farmer’s Market officially opening this week. The park includes colorful seating and tables as well as cartoonish tree-shaped psuedo-umbrellas for shade. The installation, funded by the Sunset & Vine Business Improvement District, is an upgrade from the grassy area that mostly dirt and had no furniture with brand new gravel replacing the patchy brown lawn. The L.A.-based design nonprofit LA-Más, known for combining design and policy to make an impact, designed the park. Their previous projects include the the Reseda Boulevard Great Streets makeover in Northridge and the Watts Community Studio. The May 20 opening ceremony from 5 to 8 p.m. will feature interactive stations, a photo booth, and light refreshments provided by Sweetgreen. Guests are invited to share their thoughts on how public space can be improved throughout Hollywood. What’s unique about the park is that it’s situated on private property owned by Gil Zahavi meaning this could be the start of more partnerships with private property owners that could transform public spaces in Hollywood and potentially other communities. “Hollywood Pop! is just the beginning. The park’s unveiling is an exciting opportunity to test ways public space could be improved throughout Hollywood,” Helen Leung, Co-Executive Director of LA-Más, said in an email statement to LA Curbed.